"Years after your wedding, you will look back and will laugh at how you ridiculously wore a red dress." A rebellious bride shared with us of her upcoming beautiful wedding. She excitedly showed her pegs--how she wanted a picnic organic wedding. Everyone will be in all-white, there will be white lily chairs, set against the backdrop of a beautiful ancestral white house. The twist was that she wanted to wear a short red dress and her fiancee wanted to be in shorts. Their parents were surprisingly, in full support. The bride's mom, was even defending her daughter to those who doubted her choices--that as long as her daughter was in the right, as long as they loved one another, and as long as she was getting the wedding she wanted then she couldn't ask for more. But there was a catch. The bride couldn't 100% enjoy her wedding preps because her aunt was totally against her wearing a red dress. The aunt was so against it that she even did the unthinkable--she declined to be the couple's godmother when she found out about the red dress, and even went as far as to say the mean words quoted above among other unsolicited comments insinuating that this was a sinful decision that God will not approve of. What I don't understand is why a person would exert so much effort to burst a person's bubble. A bride's wedding to be exact. And why do we do this? WHY? Knowing that a person can get hurt. Knowing that words can stab. So to all the brides out there who are toying with the idea of colored gowns but are afraid of the potential bullying you might go through, we present you with two options. First option is to let it go. You cannot please everybody! As long as you are happy, learn to tune out these nasty words and channel your energy to the happy wedding preps. Second option is to FIGHT BACK WITH FACTS. What do we mean by this? They say that White is the traditional bridal color right? Well, what if we tell you THAT'S NOT TRUE. Yes, you read that right. White gowns actually just started as a TREND whereas colored bridal gowns were the real norm. What happened was, a Queen wanted to "go against the flow" and wore white to her wedding, then some bloke created a mean poem about gown colors, while another bloke invented a symbolism for white gowns, then Coco Chanel made a short bridal gown in white then BOOM! White became the new tradition and colored gowns became a mockery. So if you want to fight back, tell your aunt or whoever that you are actually following the REAL tradition! Because colored bridal gowns WERE the real tradition back then. 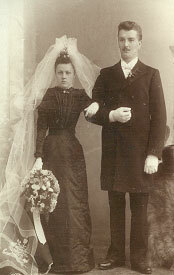 White has long been accepted as the traditional color of the wedding dress, but wedding gowns were not always white. The marriage of Queen Victoria to her cousin Albert of Saxe- Coburg in 1840 has had more influence on weddings than any other. Queen Victoria put the wheels in motion by marrying in white. The Industrial Revolution also brought about change. By the 1890’s and the arrival of the department store, almost every woman could realize her dream of being married in a “new” wedding dress. The white dress was gaining popularity and in 1890, Ladies Home Journal wrote: “That from times immemorial the bride’s gown has been white”. Although this statement was NOT true, it shows how deeply accepted it was that a wedding gown be white. Although white was popular, some brides, especially the frontier brides, wore dresses that were more practical and could be worn after the wedding. As wedding dresses closely resembled the fashions of the time, only a little alteration was needed for the dress to be perfect to wear again. Edwardian brides took the traditions of their Victorian ancestors to new extremes. Fashions became more extravagant as the decade progressed, but came to a screeching halt with the outbreak of WWI. Styles became simpler, and also reflected the changing role of women in society with hems getting shorter and the disposing of tightly laced corsets. Coco Chanel was a powerful force behind the change in women's’ fashions, and was the one who officially introduced the short wedding dress in the 1920’s. It was a white knee length dress worn with a long train. This cemented white as the universal color of the wedding dress. Thank you thank you thank you for this post! Every time I waver in my dream to wear a black gown, I just look back through your wonderful blog and feel empowered to do what's right for me and not what's expected of me :D You ladies are awesome!! I hope the bride and groom did end up wearing a red dress and shorts respectively. I also hope that her aunt eventually came to her senses and apologized to her niece. If not, it will be she who, years after the wedding, will look back and REGRET how she chose to be so judgemental and let petty biases prevent her from attending her niece's big day.